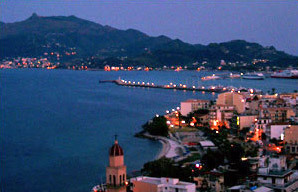 Zakynthos is located at the base of the hill of Bochali and it is at the same time chief town and main port of the island. After the earthquake that in 1953 destroyed the city the reconstruction works began and now it looks like a modern city to the tourist, a city that is expanding toward the inland because of the many activities that are there developing. Zakynthos offers many interesting things to the visitor such as the famous church of San Dionisio, that keeps the relics of the saint, the numerous museums and the characteristic squares of D. Solomos and Saint Mark; this one dated back to the Venetian period and with the only one catholic church of the island. Besides the seafront (marine road) and the small internal streets of the city there is a very interesting borough around the ruins of the ancient Venetian castle located at the top of the hill of Strani at the back of the city. Here the tiny and silent alleys, the old houses with the courtyard with flowers and the enchanting landscape dominating the bay of the city of Zakynthos will make your holiday unique and unforgettable. Once passed the port of Zakynthos and proceeding north, the beach coasting the seafront is very long and narrow; it isn’t one of the most beautiful but nearby it is possible to find different possibilities of diversion such as tennis courts, children parks and yacht clubs. The beach is populated mainly by the locals during the week end. We suggest all the same to walk along the seafront passing the beach of Zakynthos to get to Krioneri (till when the road goes up). Here it is possible to park in an area on the right and take a bath in a heavenly sea with a rocks bed. Zakynthos is connected to all the tourist centres of the island (Argasi, Kalamaki, Limni Kerì, Tsivilì, Laganas, Vassilikos and Alykes) by bus with daily runs. 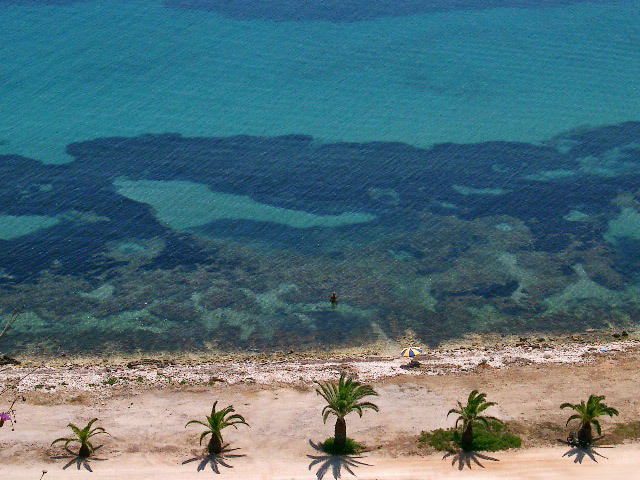 Further more it is possible to rent cars, jeeps, motorbikes, bicycles to move around the island. From Zakynthos there are tours of the entire island studied on purpose for the tourist both by bus to see the inside part and by boat to travel around the island stopping in the most amazing spots. Zakynthos is a real city offering to the tourist shops of every sort, from the ones for the tourist to the ones for the locals. There are many clothes and accessories shops, souvenirs shops, different foodstuffs shops and household articles. 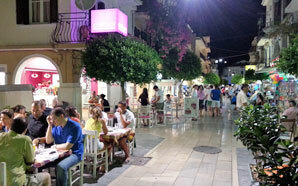 In Zakynthos it is possible to find out snack bars, traditional taverns, luxury restaurants, roof gardens and fast food. There is a huge choice for dinner and the bars and pubs to have a drink are many especially along the seafront and in Saint Mark and Solomos squares. It is lovely to stroll along the city streets and if you want to stay out late at night soon outside Zakynthos towards Argasi, there are disco pubs with paying entrance offering music till late at night. Zakynthos offers the possibility to lodge in small or big hotels whereas it is more difficult to find simple houses to rent or studios. It is easier to find villas and apartments in the surrounding areas as Bochali or Akrotiri, which are just behind the city.